You have noticed or probably have already used live chat on website to ask question for particular product or services that you were looking for. Having a live chat on your business website in Dubai able you to answer your customer’s questions or concerns on real time. It not only helps you increase sales and profits but also improves credibility that your company cares about their customers. Benefits of live chat on your business website in Dubai. Live chat make it easy to answer any questions, objections, or concerns immediately, it helps to increase sales and profits. Website visitor on live chat are more interested and likely to buy your product or services. There is a study that 20 percent of website visitors convert because of live chat. 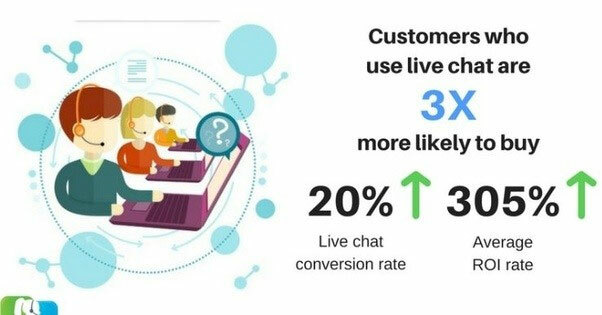 Live chat help you improve customers satisfaction, almost 90% of website visitors finds live chat useful and have better confidence on those website which offer such a facility to communicate on real time instead of sending inquiry through email or calling. Live chat improves customer efficiency, interface of online chats are very user friendly it makes easy for your customer service agent to handle more than one online chat question at the same time. It’s better than having a call center, because one agent can handle one call at a time. Customers prefer to have live chat to other communication methods, such as email, social media etc. Having a live chat feature on your business website in Dubai can give you an edge over your competitors. Another big advantage of having a live chat is it provides very useful insights about your customer’s questions and concerns. This data can be used to build a FAQ (frequently asked questions) list to improve customer’s services and prepare better answers to those questions for better customer services. Did you find this useful? Your Feedback is valuable to us. Comment or share what we missed?